Most of the 3D printer and CAD software are compatible with the STL file format. One of the reason is probably because it’s the least common denominator to describe a 3D geometry tessellation (assembly of triangles files). It can be in ASCII (like a .txt) or, to save some space and accelerate the loading/writing in binary format. From the from this description it’s obvious that it’s not very optimized as the normal can be computed from the 3 vertexes and each vertex is stored multiple time for each face in witch is appears. There is also no dimension units it’s just a geometry and the user will have to select before printing if the coordinates are in mm or inches. The usage of the last status bit is not very clear and quite useless. Everything considered the good thing is it’s very simple to write a STL file. The only caveat is to write the 3 points in the right order to have the normal of the surface pointing outside of the object (uses the write hand rule). A lot of data can be represented as a color map (the color represent the value of a particular point in the image). So I wanted to be able to transform a map into an printable STL file. The example I will take is a measurement of my hand on a Projected capacitive touch sensor that I find nice. This is the touch technology used in cellphone where each ‘pixel/electrode’ of the image is a touch intensity reading. The matlab writer (zMapToSTL function) is transforming a matrix of value in a block that can be printed. That means a border and some thickness is added under the top surface. 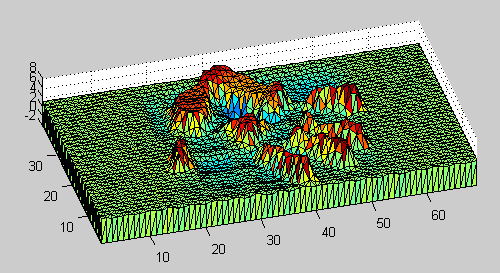 One parameter defines the number of interpolation step that needs to be done on the surface data. It is used to smooth the output but generates a lot of extra points (heavy STL). The resulting STL files are here. This entry was posted in 3D printer, Matlab, STL files and tagged 3d printing, matlab, stl files on March 15, 2013 by damienideas. I do like the single center point to build the faces under the block it’s very elegant. The shell/thickness option is interesting to save material.